Abtrex Industries dual laminate lining system (AB-DLS) was originally developed for chrome plating tanks. Since then, dual laminates have been utilized to store and transfer a variety of corrosive and high purity liquids in tanks, pipes, and other equipment. As with all our projects, engineers place a heavy emphasis on proper surface preparation. Once the surface is ready, a traditional thermoplastic layer is applied onto the surface of the steel substrate. A fiberglass reinforced plastic (FRP) corrosion barrier is then applied over the top of the thermoplastic layer. Abtrex utilizes a proprietary bonding agent ensures proper adhesion between layers. The FRP lining functions as the primary corrosion barrier, while the thermoplastic membrane provides a second layer of corrosion resistance in the unlikely event of a breach in the FRP. The thermoplastic layer also provides a flexible cushion between the rigid FRP and steel surfaces. The result: AB-DLS linings combine excellent chemical and temperature resistance with the superior durability of a steel structure. Abtrex engineers can help you determine the best lining system for your application. AB-DLS liners are typically used when the corrosive service exceeds the limit of traditional lining materials like rubber or PVC. 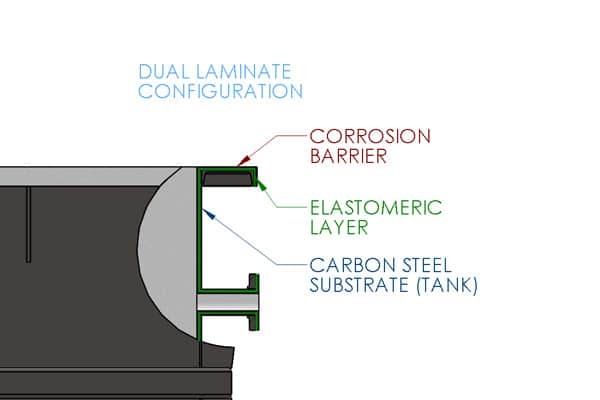 Dual laminates are often more cost effective when compared to other materials such as high-nickel alloys. AB-DLS also provides a low maintenance alternative to glass lined and brick lined systems. Abtrex has tanks with AB-DLS linings that have been in constant service for more than 15 years. Abtrex is confident that the reliability and reduced maintenance costs of a dual laminate system will add to your bottom line for years to come. Contact an Abtrex engineer today to tell us more about your lining needs.